The name sesnsor is derived from its operation as a sensing tool. Sensors are mainly used to measure physical values. Today, sensor usage is common in many areas while the automotive industry is one of them. Sensors are designed to sense mechanical movements and changes, as well as changes in energy forms. Information from the sensors is processed by computers that translate it into operation. The purpose of the oxygen sensor is to maximize the engine efficiency and produce as few emissions as possible. Almost	every car produced in the last 20 years has an oxygen sensor for that purpose of regulating the fuel mixture. Oxygen sensors are surprisingly rugged considering the environment they are in. The performance of the oxygen sensor tends to diminish with age and eventually, sensors wear out and have to be replaced. Most oxygen sensors wear out after 50,000km - 80,000km of usage. Newer sensors with heating option, will last 100,000km - 160,000km according to the type of driving and the conditions (city/highway). A rich mixture is when there is less air than in the optimal ratio (perfect ratio). In that case, fuel leftovers are found after combustion. This unburned fuel creates pollution and therefore, a rich mixture is bad. A lean mixture is the opposite, means when there is more air than in the perfect ratio and then there is an excess in oxygen. A lean mixture tends to produce more nitrogen-oxide pollutants, and in some cases, it can cause poor performance and even engine damage. 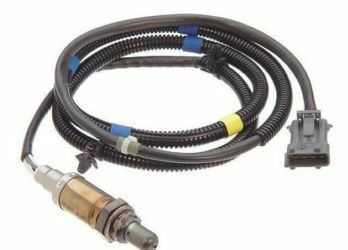 The oxygen sensor detects if the mixture is rich or lean by using (in most cases) a chemical reaction that generates a voltage which is sent to the ECU. The ECU examines the voltage to determine if the mixture is rich or lean, and controls the amount of fuel the engine receives accordingly. The mass air flow sensor determines the mass of air that enters the engine. The density of the air changes with temperature and pressure differences. Mass airflow meter Therefore, it is used to calculate the correct air mass to the engine's operation under changing conditions. When a mass airflow sensor is used in conjunction with an oxygen sensor, the engine's air to fuel ratio can be controlled very accurately. N. Eyal & Co. vehicle lab specializes in electronic systems diagnostics and repairs.